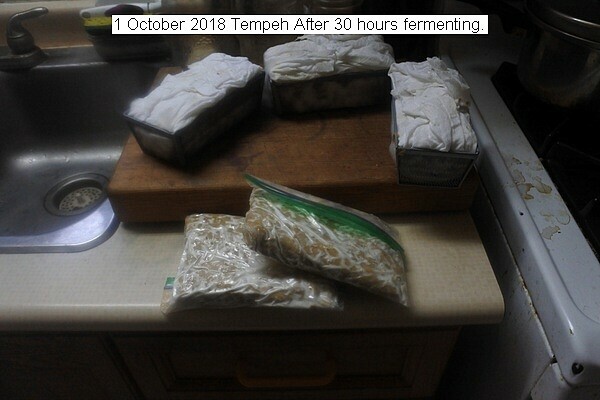 A batch of tempeh was made. Fermentation was 30 hours. The extra soy beans were placed in ziplock bags with holes punched in the sides for air. The beans were pressure cooked for about 65 minutes. This made the beans reasonably soft and the fermentation was quicker than usual. Indicating the over cooking is beneficial. The fermented beans were placed in a pot and kept at room temperature to ferment longer. Black spores will form which probably indicates full maturity. This entry was posted in Uncategorized and tagged 1 October 2018 Tempeh. Bookmark the permalink.